Classic Antique Glaza Recipe - Interior design knowledge for the creative lifestyle. The "maison a pains de bois" (wooden beam house) is a fine example of the evocative crookedness at the heart of Rustic French style. This Tudor-style building's slanted walls, gently undulating roof, and geometric beams are at once imposing and humble. 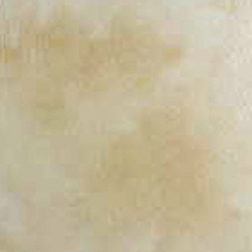 Antique Glaze Create the perfect antique finish. 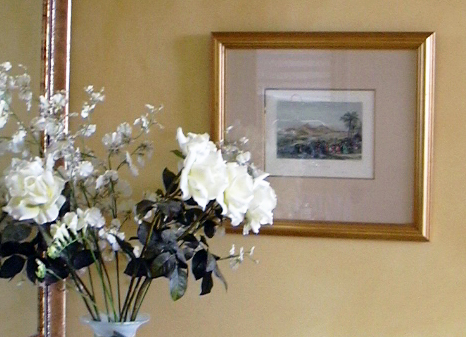 Furniture, objects, paintings, wall and ceilings. Our exclusive line of custom antique glazes are idealy suited for interior and exterior applications. This acrylic based medium is eco-safe, easy application and clean up, with enhanced color saturation. Great for all weather conditions. 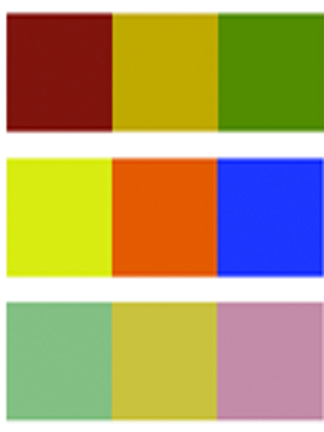 Pre-mixed colors for historic application, thematic and geographic design styles. Create your own custom color with vibrant Mixol pigments. Mica Powder. - Mixol, a high-quality tinting paste made in Germany, is highly concentrated and will add color to almost any type of paint or coating materials. A binder-free, glycol-based product, Mixol is made for hand mixing and is easily suspended in water, oil or solvent bases. 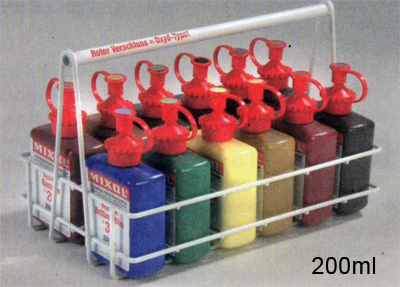 Colors are so concentrated that Mixol is usually measured by drops, not ounces. The product is very popular with faux finishers who want to color-correct a batch of paint. What is an "Antique Glaze'? Antiquing is the process of aging a surface to produce a time-worn appearance. 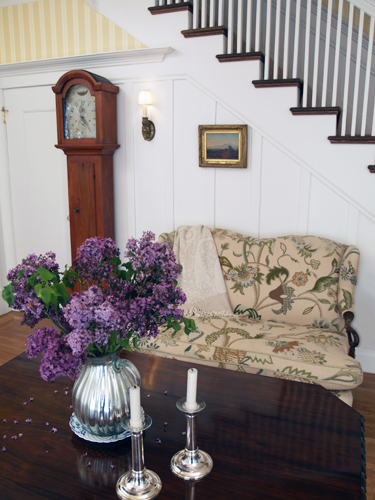 There are many methods of antiquing objects, furniture, mural paintings and wall surfaces. These include paint effects, waxes, weathering, physical distressing and accent- antiquing that mimic the natural aging process by replicating such things as fly specks and worm holes. Generally, paint and glaze antiquing methods can be used universally on furniture, objects, murals, gilt surfaces, floors, painted ceilings and walls to create an aged look. The color combinations that create a ‘classic antique glaze’ remain the same whether using oil based (alkyd) or water based (acrylic) products. 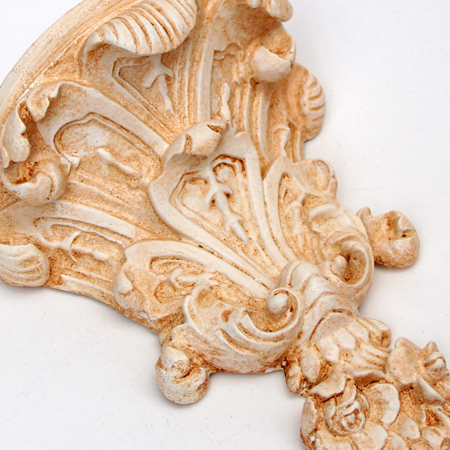 Pre-mixed glazes - for decorative and faux effects on walls, ceilings furniture and objects. 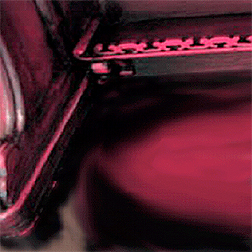 Create classic effects such as colorwashing, dragging, striee, antiquing effects, or furniture effects. 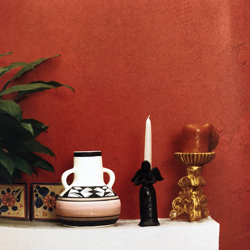 Our interior and exterior glazes offer a high-end decorative paint solution that provides soft, delicate, subtle shades with either pearl, satin, or glossy tones for maximum depth and decoration. Flouart is an acrylic based glaze for interior finishes that creates soft shades or spectacular decorative effects. Available in a pearl base, satin base, or clear, Flouart is a washable decorative paint applicable to walls, wood, metal, and plaster. Its inherent versatility allows for thousands of different aesthetic solutions depending on the tools or techniques used to apply it. Contrast Pearl is a hard-wearing pearlescent paste specifically formulated to create numerous faux effects with one simple application.Pearl dries to a lustrous, satin finish. 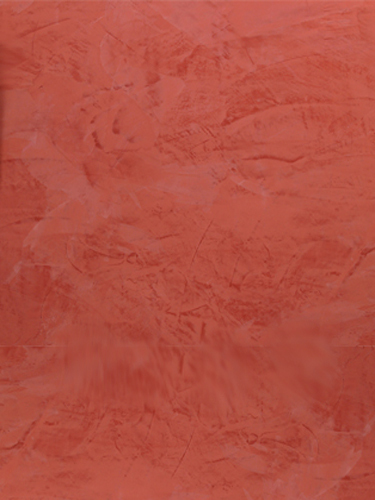 Velur Interior or exterior glaze, Velur is an ideal glazing medium for mineral based plaster and stucco effects. Applicable by brush or other faux tools, Velur glaze creates delicate tones and transitions in a wide variety of saturation and opacity. We come up with a standardized mixing formula for a 'Classic Antique Glaze' that most closley represents the natural aged toning of objects over time. This umber/brown tone works well over objects and furniture, aging over gilded surfaces and anything you want to look older or time worn. 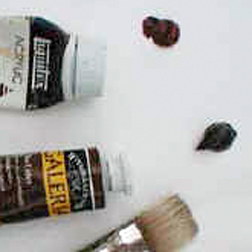 Mixing these 3 colors will create the 'Classic Antique Glaze' tone suitable for most any object needing some basic aging. 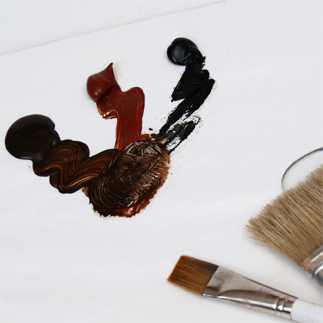 Of course, you can play with the blending proportions, but we've found this ratio blend to be quite versatile. Thinning your color glaze to the correct transparency. Thinner- mineral spirits (oil-based) or water (water-based). View chart below. 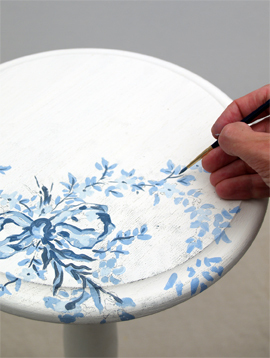 Varying the amount of thinner will adjust the darkness or lightness of the antique glaze. This recipe can be used alone or adjusted for specific decorative finishing jobs with the addition of a glaze coat, or varnish. 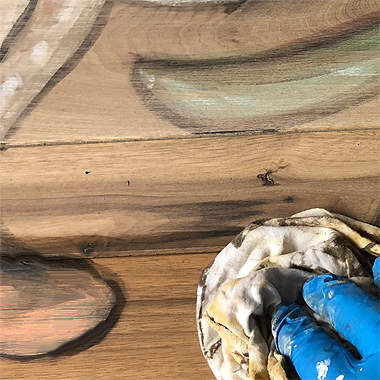 Some decorative treatments, including color washing, rag-rolling, marbling and wood graining, require the use of glaze coat. Note; For large areas, walls and specialty finishes, the addition of glaze coat and/or varnish will be necessary. 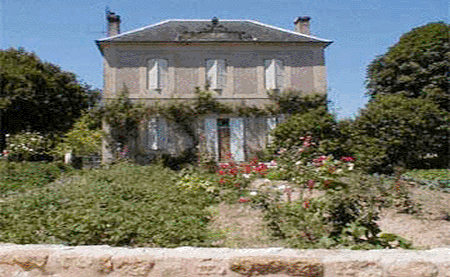 Weathering Antiquing process that exposes the item or surface being treated to the natural elements. Driftwood is an example of the natural weathering process of wood exposed to salt water and air of the ocean. 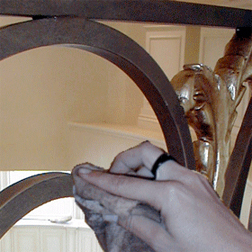 Methods like sanding, and pickling or bleaching can result in effective weathered appearances. Burying objects in the ground for periods of time is a common practice to weather objects. Physical distressing Most commonly employed to antique furniture and objects, physical distressing is controlled abuse applied to an object or furniture piece. Methods of physical distressing include the use of chains, hammers, nails and sandpaper. In attempting to mimic the effect of natural wear and tear on an object, always keep in mind what would occur naturally to the piece over time. Slightly rounded corners, scuffed up legs and edges, worn handles, dings and dents all over. Worm holes are produced by the random nail hole, driven in then removed. Fly Specks replication of the tiny specks left by fly droppings. Commonly seen on frames and furniture, fly specks can add an authentically antique appearance. Fly specks are creating using the spattering technique and are randomly applied over entire object. Worm Holes Primarily used in furniture and frames. This process simulates the holes that have been created by woodworms over extended periods of time. Using a hammer and a small nail, holes are created by driving the nail randomly into the surface, then removing the nail. Remember not to go too deep and to keep the pattern irregular. Polished Plaster, or Stucco Veneziano, is a traditional wall treatment that provides a glossy, visually textured wall finish. Venetian Plaster is a natural formula composed of organic ingredients, calcium, and acrylic binders creating a decorative paste plaster for interior applications. Polishing the surface compresses the calcium within the compound, creating a narble-like finish, cool and hard to the touch. This treatment is quite versitile, ranging from a rustic backdrop to a refined and elegant finish.